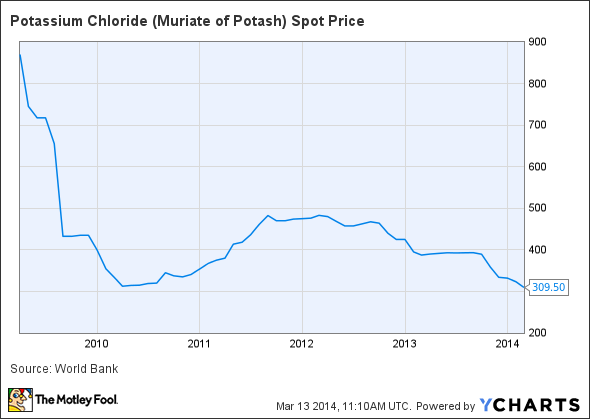 Which Potash Producer Will Cut Its Dividend Next? Will the dominoes fall after Europe's leading potash player slashes it's payout? There seems little worry that PotashCorp (NYSE:POT) will cut its dividend -- which it called "sacrosanct" this past December -- even though it's planning on cutting some 18% of its workforce this year in the face of flagging demand. Yet, Europe's leading potash player K+S (NASDAQOTH:KPLUY) just said that, because of the upheaval that's occurred in the market, it was slashing its dividend by 82% for 2013, reducing the payout ratio to just 11% of adjusted after tax earnings, a far cry from the miner's usual ratio of between 40% and 50%. Could this signal a new era of austerity that will ultimately see Potash, Agrium (NYSE:AGU), and Mosaic (NYSE:MOS) end up whacking their payouts, as well? Revenues at K+S barely moved at all last year, creeping up to 3.95 billion euros from 3.935 billion, but operating earnings fell by 18% from the year ago period because of lower potash prices. China recently set a new, lower floor for pricing after reaching an agreement with Russian potash producer Uralkali for $305 per metric tonne for the first half of 2014, a 24% discount to the levels paid in the same period last year. Shortly thereafter Canpotex, the North American potash marketing arm owned by PotashCorp, Agrium, and Mosaic, also signed a contract for the sale of the fertilizer nutrient into China. Though it didn't disclose the deal's value, it said it was at competitive rates. Last year, it had secured a price of $400 per tonne. There was a lot of speculation beforehand on what price China would pay for potash, as its purchases typically set the tone for contracts everywhere. It's the world's biggest wheat grower and second-biggest corn producer, so it remains a significant importer of potash along with the U.S., India, and Brazil. Buyers held off on making purchases until greater clarity was given as to where pricing would go, though the market expected them to settle in the $300 level following the breakup of the Belarusian cartel last summer; but no one wanted to be first to jump the gun. With that event out of the way now, however, the surety potash producers were seeking seems to have returned. There's even the possibility the cartel will get back together, possibly leading to higher prices once more. Uralkali broke away from the partnership it had with Belaruskali in a bid to gain more market share. As a low-cost producer, it was willing to sacrifice price for volume. That sent everyone else into a tailspin, and caused the slump that led to K+S slashing its dividend. The miner will use the savings to bump up its own production by expanding its Legacy project in Canada, with the goal of bringing it online in 2016 despite the weak pricing environment at the moment. A dividend cut for PotashCorp still doesn't appear to be in the cards. Unlike K+S, which discontinued its nitrogen operations in 2012, the North American producer achieved record nitrogen sales volume of 5.9 million tonnes last year, 19% above the year-ago totals, even though prices were weaker. It's also still producing significant amounts of free cash flow, almost $1.6 billion worth at the end of 2013, suggesting it has substantial financial resources still available to it. Agrium, on the other hand, burned through cash last year, recording a $100 million deficit in free cash flow, which could always pressure its payout that is currently yielding 3.2%. Mosaic, the fourth largest producer of potash in the world accounting for approximately 14% of estimated global annual potash production and 43% of estimated North American annual potash production, was also FCF positive, which should keep its 2% dividend intact. If the situation in the Ukraine breaks down further, and sanctions are imposed on Russia, potash producers could even gain as potash remains an important export for the country. Although K+S found it expedient to cut its dividend to finance its growth program, I don't see Potash or Mosaic following suit. If conditions fail to markedly improve, however, Agrium could see pressure mount to conserve its cash.